We are all aware of how painful, lonely, confusing, and restless life on earth can be. Often times when I'm alone with my thoughts, I find my heart seeking peace, rest, and renewing. I know I'm not alone in this feeling. When Jesus walked on earth, he saw right through our masks we put on each day that say "I'm fine". 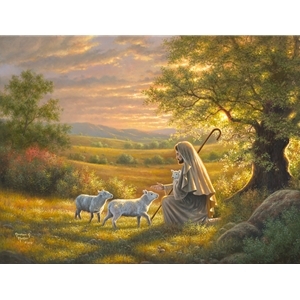 In this painting, we see Jesus as the loving shepherd. He has called the lambs out of the dark brush and briars and into the Son's light. As they draw closer, he reaches out to hold them. I hope when you view this painting, you can hear Jesus say to you "come unto me, you who labor and are heavy laden, and I will give you rest."